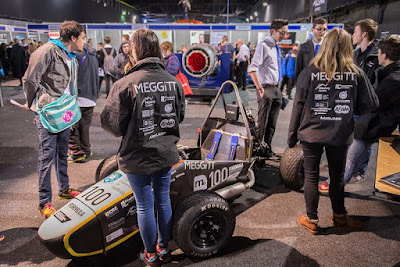 Get up to Speed (GUTS), the region's largest engineering and skills event specifically for young people will return to the Magna Science Adventure Centre in Rotherham next year. This hugely popular interactive event is designed to showcase science, technology, engineering and manufacturing and its employers to young people, parents and educators in the South Yorkshire region and beyond. Attracting over 2,100 attendees in 2017, the event aims to inspire; build confidence and knowledge in these sectors as a great place to work in a fun and interactive way. The event started in 2011 and moved to Magna in 2015. The 2018 event will take place on April 18. A number of local and national employers and organisations are already signed up to sponsor the event, including South Yorkshire companies Liberty Speciality Steels, Cooper Brown Enterprises, AESSEAL plc, Doncasters Bramah, Highlander IT & Telecoms, plus the Institution of Mechanical Engineers (IMechE) and the Institution of Engineering and Technology (IET). School children will be attending, not only from South Yorkshire, but from all over the UK. Over 30 exhibitors are confirmed already more local and regional businesses can get involved to showcase themselves to young people and help share this unique celebration of engineering and manufacturing. John Barber CEO of the work-wise Foundation and Chair of the GUTS Steering Group, said: "Engineering alone requires 186,000 new staff nationally every year between now and 2024 to fill the expected skills gap. Companies that take part in Get up to Speed understand the need to promote the industry to young people to ensure that there are enough talented and skilled recruits entering the industry to fill the growing skills gap. Get up to Speed also helps to enthuse the next generation of engineers." Many local companies and some national companies get involved in the event through the work-wise Foundation and attend with their apprentices and graduates to talk to young people and those who educate and influence them about the opportunities and careers open to them. Eight years on some of those early visitors are attending as apprentices and graduates and telling their own stories and inspiring others. Mick Hood, human resources director at Liberty Speciality Steels, said: "We continue to support the Get up to Speed event because it is a fantastic way of raising awareness among young people, teachers and parents of the exciting opportunities on offer when you choose an engineering or science-based career. Each year the event goes from strength to strength and the 2018 GUTS looks like it will be the best and best yet!" Barber added: "Get up to Speed is free to visit and is designed to inspire and inform through a wide range of hands-on activities, showcasing many different businesses from traditional to advanced technologies plus support and education organisations. For the 2018 event we will extend the focus to science and technology as well as engineering and manufacturing as we recognise the ever changing range of opportunities opening up to young people." Get up to Speed consists of a range of interactive and exciting activities, which has included Virtual Reality Welding, CNC Machining, VR and Augmented Reality tools for the rail industry to a human powered sail rocket and hang gliders, a bi-plane with Vulcan and a female stunt pilot. Inspirational vehicles have been displayed including the Bloodhound SSC, F1 cars, Drag and Racing Motorcycles, Armoured Military Vehicles, Rail Ranger off road vehicle that also runs on rail tracks and University Formula Racing Teams, a friendly Dalek robot! There will also be teacher awareness seminars on the day so they can take back to school knowledge and practical information.